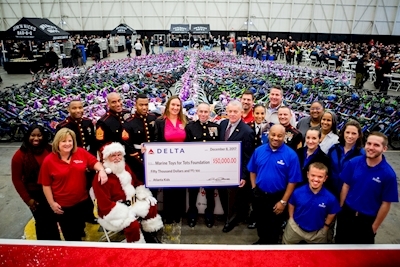 For many years Delta has partnered with Marine Toys for Tots to make kids' lives brighter during the holiday season. This year Atlanta's Technical Operations Team raised nearly $57,000 to provide over 1,000 bikes, helmets, toys and gifts to kids in the local community. At the holiday celebration where the bikes were gifted earlier this month, Mike Moore, Delta's S.V.P. — Maintenance Operations, presented a check for $50,000 to Toys for Tots Foundation. Don Mitacek, Delta's S.V.P. — Technical Operations commented, "It is always a joy to see hundreds of bikes displayed throughout the hallway of the ATL TOC [Atlanta Technical Operations Center]. 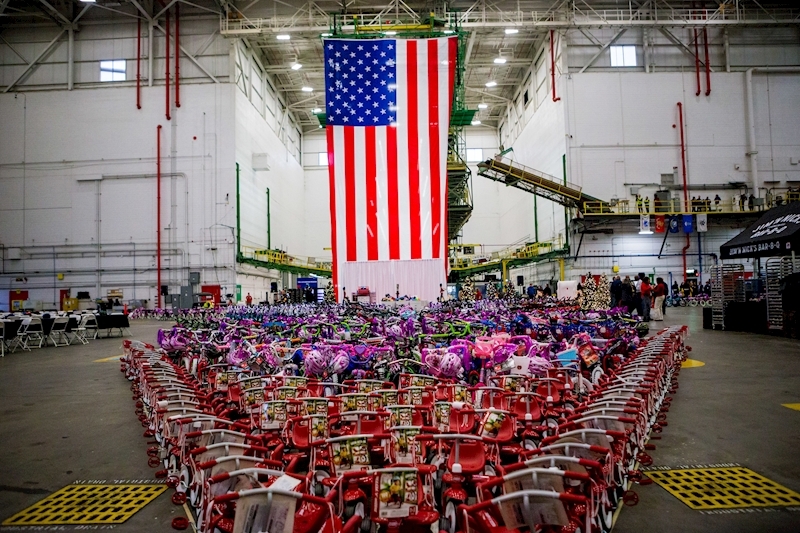 It's such a proud moment to know that many of the employees volunteered their time to assemble the bikes and/or gave generous donations to purchase bikes, helmets and toys. This is truly the spirit of Delta TechOps." As a part of Delta's total corporate contribution of $700,000 systemwide, Delta CEO Ed Bastian thanked the Marines for their service and presented a check to Lt. Col. Juan P. Svenningsen and Staff Sgt. David M Wright, Jr. from Atlanta Toys for Tots in the amount of $25,000 during the airline's annual Investor Day, which was held in Atlanta on Dec. 14.. The mission of the U. S. Marine Corps Reserve Toys for Tots Program is to collect new, unwrapped toys between October and December each year, and distribute those toys as Christmas gifts to less fortunate children in the communities in which the campaigns are conducted. This fulfills the primary goal of providing a message of hope that will assist them in becoming responsible, productive, patriotic citizens. Delta is proud to be the Airline Partner of Toys for Tots and a National Corporate Sponsor of the Marine Toys for Tots Literacy Program. The Literacy Program's mission is to offer economically disadvantaged children the ability to compete academically and to succeed in life by providing them with books to enhance their ability to read and communicate effectively.